*site on March 2 and March 16, respectively. followed by one to three relapses. Of the 11 patients. camp outs contracted the illness (Table 2). Results on the other ticks are pending. kane City Health Officer; E. 0. Ploeger, M.D., M.P.1H. toryH,IAD, Hannton. Montana; and an EIS i.'. '',* r.
*It should be noted that tick-borne relapsin. fever is an option. olt female employee of a combing mill in Massachusetts. ples taken at the mill were negative for B. anthracis. while samples of alpaca and camel hair were negative. Laboratory investigation points to imported cashmere. century. II. Epidemiology. Amer J Ilyg 72:6, 1960.
with Clostridium botulinum has been reported from Fresno. was surgically debrided and the fracture reduced. ing because of the accumulation of secretions in his mouth. were all within normal limits. no evidence of gas formation in the surrounding tissues. The wound site was cultured, and results are pending. the wounds were also infected with other organisms. linum in a fatal wound infection. JAMA 146:646-648. 1951.
infection. J Bact 61:647, 1951.
of vision. Over the next 2 days she became short of breath. tongue, and developed weakness of all four extremities. On May 19, she was hospitalized. strength in her extremiiies and ocular muscles. can smelled unusual. The patient tasted the vegetables . no (lostridium botulinum when cultured. During the 4-ixeek period. April 21 through May lb. the comparable 4-week period in 1967. Of these 3:l areas. ing the comparable period in 1967.
districts reported a total of 10 or more cases (Table 3). 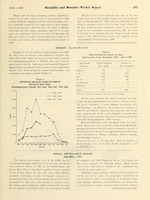 corresponding 4-week period in 1967.
ported and in 1965-66, 1,836 cases were reported (Figure 3). occurred in preschool children (Table 4). NOV. DEC. JAN. FEB. MAR. APR. MAY JUN. JUL. AUG. SEP. OCT.
state New York population (1960 census). to the location in these states of major military centers. group, of which they comprised 29 percent. identified in 2,735 of the 2,815 cases (97.2 percent). 'WHO Wrekly EpdemIolog.c Record, 43:(5174-75. Feb. 2, 1968.
compared with 12 in 1966.
with only 15 percent of the vivax cases. with 30 cases in 1966 and 19 in 1965 in foreign visitors. (82.7 percent), P. falciparum in 329 cases (12.5 : i-. cr i.
charge from the military service. acquired his infection in Vietnam (MMWR, Vol. 17, No. 13). (MMWR, Vol. 17, No. 4). July 1967; the etiologic agent was P. vivax (MMWR, Vol. Bowling Green, Kentucky (MMWR, Vol. 16, No. 35). will eliminate the parasite in most cases. Technical Report No. 375, Geneva, 1967.
malario-therapy, blood transfusion, common syringes. show two injections at an interval of 1 week. cation with the health administration concerned. *Estimate based on average percent of divisional total. serotypes from human sources are listed. nonhuman serotypes are listed in Table 6. CHIEF. EPIDEMIOLOGY PROGRAM A. .r.-M., M.D. ACTING CHIEF, STATISTICS SECTION" IDA L. SHERMAN. M.S.